Are PMCs dangerous or a necessary adjunct to state forces and international peace and stability endeavors? PrivateMilitary.org is pleased to introduce Private Armed Forces and Global Security, the first academic title to approach Private Military Companies constructively and not as dangerous forces. This is a featured item page, please use the menu on the left to return to the Books main page, or the options below. Private armed forces are nothing new. The estimated ratio of contractor to military personnel during the American Revolution was about 1 to 6. Yet the use of private military companies (PMCs) has proliferated exponentially since the 1990s, and today, they are sometimes seen as a threat to global security. But are PMCs dangerous or a necessary adjunct to U.S. forces and international peace and stability endeavors? 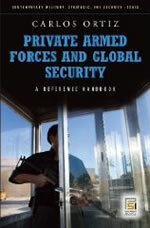 Private Armed Forces and Global Security is the first book to provide a comprehensive yet accessible survey of the private military groups involved in conflicts worldwide. It covers the history of private military forces since 1300, the main contemporary actors and their defining characteristics, the environments in which PMCs and adverse private forces operate, and provides an analysis of the logic behind the contracting out of defense, homeland security and reconstruction tasks to the private military industry. This book goes beyond conventional knowledge, offering both a theoretical approach and a new, practical perspective of the ongoing climate of global instability and relevant players within it. Numerous examples and appendixes help the reader grasp the full range of real-world challenges and conceptual facets surrounding this fascinating, yet highly polarizing topic.